If you are in the position of currently seeking a party bus in Auburn Hills, then your search has finally come to an end. Here at Rockstarz Limousine and Party Bus, we specialize in not only providing you with the best possible experience, but we fully understand what is expected by anybody that is looking to rent a party bus. 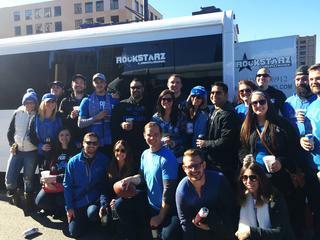 Our Auburn Hills party bus service is designed to make maximum use of the space available. This will allow you to invite even more guests along than ever before and we have even sought to include a number of leather chairs to allow people to simply rest while the party rages on around them. Furthermore, the key thing when it comes to an Auburn Hills party bus rental is making sure that everybody is able to have an amazing time. That kind of thing comes naturally to us as we have sought to include everything that you will be seeking in what will effectively become your own nightclub on wheels. Cruising around the city is going to take on a whole new meaning to everyone on board when you hire our party bus. First, you will discover that we have installed a state of the art sound system, which is just going to allow for that music to be blasted throughout the bus and create a wonderful atmosphere. In addition, we have incorporated a laser light show that just adds to that atmosphere and takes things to a whole new level. On top of that, you have your own professional driver who is going to be at your service during your time spent with us. In the past, people have used our service for a number of different celebrations from a birthday party, to anniversary, bachelor and bachelorette party, and even just some friends getting together for a great time. No matter the reason, we can deal with any request that you may have, and we will do so professionally from start to finish. So, if you do indeed live in the Auburn Hills area and are looking for a party bus for any occasion, then make life easier for yourself and give us a call here at Rockstarz Limousine and Party Bus. Alternatively, you can contact us via our website and a member of our team will be in touch as soon as possible to discuss your own individual requirements.